I lived at 131 Wilson Avenue from 1959 until 1975; this was a chalet bungalow scheme where the dads worked themselves to death three out of four weekends a month, plus some week nights, for three years. My dad was Gauger Pitt, and I was known as Little Gauger, his part-time helper. The gauging was mixing the plaster that covered the insides of the breeze blocks, I think. All of the dads had construction specialties and somehow it all worked. What fun it was to grow up and play in a building site, helping dig trenches with picks in the impossible chalk, unloading bricks and hammering nails anywhere there was a piece of wood. I used to help paint the window and door frames with pink undercoat. The Regans lived at 117; Nicolas and June Penn at 115. I believe my older brother Ray was the ringleader, but I can vividly remember a group of us tossing penny banger fireworks into the tea hut on Guy Fawkes Night, when the poor exhausted dads were trying to enjoy their tea break. In those days Wilson Avenue was one bleak place. There was nothing like being exposed to those gales and rainstorms on the crest of the hill. This was all before central heating and double pane windows. We used to have ice on the inside of the windows on winter mornings. But the sea sparkled when the sun came out, and what a wonderful time we all had on the beaches and the tide pools at the pre-Marina Black Rock. Does anyone remember when Wilson Avenue was closed on race days? They covered the road with straw. We saw the start of the race from upstairs on the front of the house, then dashed to the bathroom window on the other side of the house to see the finish, although the grandstand obscured the actual finish line. The best part of Wilson Avenue living, was playing in what we called the corn field right across the road for the chalet bungalow scheme. 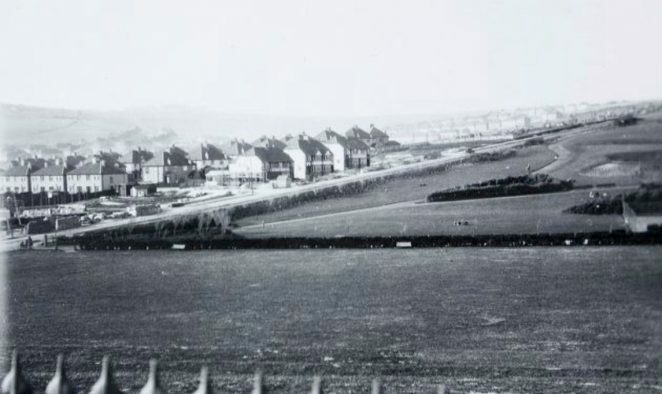 This was years before the school was built and you could walk right across Sheepcote Valley and up to the right where the East Brighton Golf Course was located. We could also see Roedean School from the front upper bedroom windows. There were lots of abandoned, rusty junk cars to fool with and roll down the hill. We were visited from time to time by foxes from either the corn field or the rubbish tip. Sometimes the corn fields were home to feeble and clumsy efforts to kiss young girls; the attraction being both the girl, and the long grass that offered some privacy from being seen from the road. Many flagons of cider obtained from an off license on Rock Street were also chugged down in the long grass. At 129 Wilson Avenue lived PC Jeff Hopkins. Somehow we never heard a squeak from him while all of the delinquencies were going on. I left in 1975 and have lived in San Francisco ever since, but will never forget those years or the good people. Cheers to you all. Hate race days, as soon as I spot the camera’s on the cranes I can’t help but moan! Takes the horses ages to get into the starting stalls and get gone! There needs to be signage saying as you come eastwards from Woodingdean, to inform of the races going on! How interesting, thank you for sharing this story. Do you have a photo of the bungalows completed? Hello Malcolm, Alan here. I lived next door 133, I remember your Dad’s Morris Minor: soft top, white/cream with red soft top – how cool! My Dad had an ex GPO van, he cut windows in the side and put a seat in the back for us kids, myself David and Jane. We did a good few miles in that, he then up-graded to the Traveller version, first in black then a green one. Being a chippy I think all the wood appealed (bless him). Nice to read your piece, will try and visit this site again soon. The Regans loved seeing the name. They still live there - Les and Glad and Kath and Jim are all my relatives. Hi Malcolm, I do remember you. I used to live at 119 with Mum & Dad, Joan & Frank Fleet, neighbours were the Regans, Mellins, Knights and Lyons. Dad died in 1996, but Mum came with us to France when we came here to retire, and sadly passed away in 2014, aged 95. I well remember many of the tradesmen who worked on the scheme.